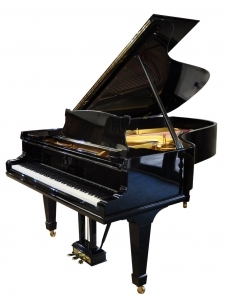 Thanks to a very generous donation from two supporters of the Goods Shed Arts Centre, we now have a wonderful Steinway B piano in the auditorium. 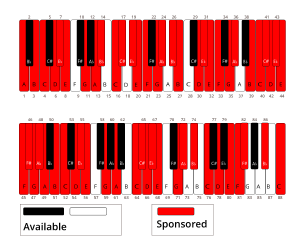 Can you help us reach our target by sponsoring one or more of the 88 piano keys with a donation of £88 per key? If so, please use the form below to make your donation to the appeal. Alternatively, you can simply donate any amount you choose, without specifying a particular key. We will keep a permanent record of all sponsors, which will be displayed in the Goods Shed when we have reached our target. If you have any questions about the appeal, please contact the Trust treasurer, David Walker on 01666 500137, or the Arts Centre administrator, Kathryn Limoi, on 01666 505496 or by email at office@shed-arts.co.uk. The diagram below shows the keys that are already sponsored and those which are available. Click on the diagram to open a larger version if needed. When you have chosen a key or keys, use the sponsorship form below to tell us the number on the diagram that corresponds to each key you have chosen, together with the name or inscription you want to go on the list of donors. Note there is a limit of 25 characters and spaces for each inscription. We’d love to stay in touch with you from time to time to tell you about our work, fundraising and campaigns. Contacting you by email offers us a cost-free way of keeping in touch. If you’re happy for us to contact you in this way, please tick the box below. You can change your mind at any time, just send us an email. Yes I want to Gift Aid my donation and any donations I make in the future and have made in the past four years to the Tetbury Goods Shed. I agree to the Tetbury Goods Shed Terms & Conditions.